A recent talk about unordered_map in C++ made me realize, that I should use unordered_map for most cases where I used map before, because of the efficiency of lookup ( amortized O(1) vs. O(log n) ). Most times I use a map I use either int's or std::strings as keys, hence I've got no problems with the definition of the hash function. The more I thought about it, the more I came to realize that I can't find any reason of using a std::map in case of simple types over a unordered_map -- I took a look at the interfaces, and didn't find any significant differences that would impact my code. Hence the question - is there any real reason to use std::map over unordered map in case of simple types like int and std::string? I'm asking from a strictly programming point of view -- I know that it's not fully considered standard, and that it may pose problems with porting. Also I expect that one of the correct answers might be "it's more efficient for smaller sets of data" because of a smaller overhead (is that true?) -- hence I'd like to restrict the question to cases where the amount of keys is non-trivial (>1 024). Edit: duh, I forgot the obvious (thanks GMan!) -- yes, map's are ordered of course -- I know that, and am looking for other reasons. Don't forget the map's keep their elements ordered. If you can't give up that, obviously you can't use an unordered_map. 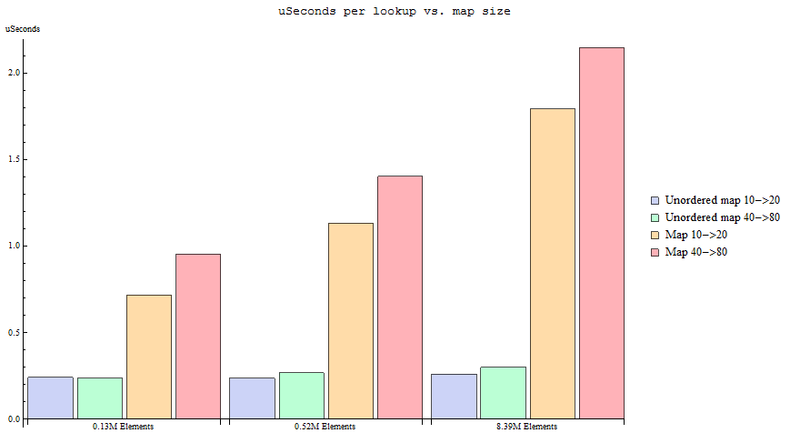 Something else to keep in mind is that unordered_map's generally use more memory. A map just has a few house-keeping pointers then memory for each object. Contrarily, unordered_map's have a big array (these can get quite big in some implementations) and then additional memory for each object. 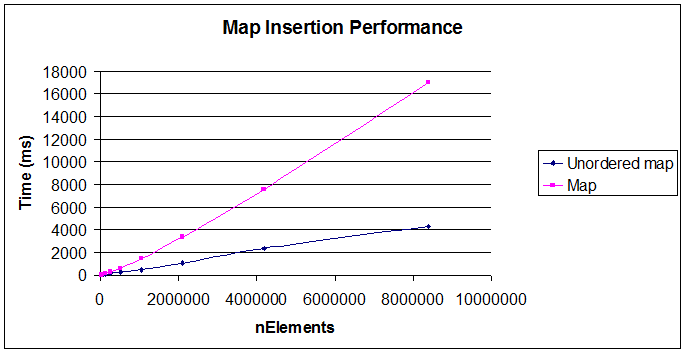 If you need to be memory-aware, a map should prove better, because it lacks the large array. So, if you need pure lookup-retrieval, I'd say an unordered_map is the way to go. But there are always trade-offs, and if you can't afford them, then you can't use it. Just from personal experience, I found an enormous improvement in performance (measured, of course) when using an unordered_map instead of a map in a main entity look-up table. I'd echo roughly the same point GMan made: depending on the type of use, std::map can be (and often is) faster than std::tr1::unordered_map (using the implementation included in VS 2008 SP1). There are a few complicating factors to keep in mind. For example, in std::map, you're comparing keys, which means you only ever look at enough of the beginning of a key to distinguish between the right and left sub-branches of the tree. In my experience, nearly the only time you look at an entire key is if you're using something like int that you can compare in a single instruction. With a more typical key type like std::string, you often compare only a few characters or so. A decent hash function, by contrast, always looks at the entire key. IOW, even if the table lookup is constant complexity, the hash itself has roughly linear complexity (though on the length of the key, not the number of items). With long strings as keys, an std::map might finish a search before an unordered_map would even start its search. Second, while there are several methods of resizing hash tables, most of them are pretty slow -- to the point that unless lookups are considerably more frequent than insertions and deletions, std::map will often be faster than std::unordered_map. Of course, as I mentioned in the comment on your previous question, you can also use a table of trees. This has both advantages and disadvantages. On one hand, it limits the worst case to that of a tree. It also allows fast insertion and deletion, because (at least when I've done it) I've used a fixed-size of table. Eliminating all table resizing allows you to keep your hash table a lot simpler and typically faster. One other point: the requirements for hashing and tree-based maps are different. Hashing obviously requires a hash function, and an equality comparison, where ordered maps require a less-than comparison. Of course the hybrid I mentioned requires both. Of course, for the common case of using a string as the key, this isn't really a problem, but some types of keys suit ordering better than hashing (or vice versa). I was intrigued by the answer from @Jerry Coffin, which suggested that the ordered map would exhibit performance increases on long strings, after some experimentation (which can be downloaded from pastebin), I've found that this only seems to hold true for collections of random strings, when the map is initialised with a sorted dictionary (which contain words with considerable amounts of prefix-overlap), this rule breaks down, presumably because of the increased tree depth necessary to retrieve value. The results are shown below, the 1st number column is insert time, 2nd is fetch time. I would just point out that... there are many kind of unordered_maps. Look up the Wikipedia Article on hash map. Depending on which implementation was used, the characteristics in term of look-up, insertion and deletion might vary quite significantly. For example some hash maps have linear rehashing, where instead of rehashing the whole hash map at once, a portion is rehash at each insertion, which helps amortizing the cost. Another example: some hash maps use a simple list of nodes for a bucket, others use a map, others don't use nodes but find the nearest slot and lastly some will use a list of nodes but reorder it so that the last accessed element is at the front (like a caching thing). So at the moment I tend to prefer the std::map or perhaps a loki::AssocVector (for frozen data sets). Don't get me wrong, I'd like to use the std::unordered_map and I may in the future, but it's difficult to "trust" the portability of such a container when you think of all the ways of implementing it and the various performances that result of this. What makes a good hash function depends on your data's characteristics; so if I don't plan on looking at a custom hash function (but can certainly change my mind later, and easily since I typedef damn near everything) and even though defaults are chosen to perform decently for many data sources, I find the ordered nature of map to be enough of a help initially that I still default to map rather than a hash table in that case. Plus that way you don't have to even think about writing a hash function for other (usually UDT) types, and just write op< (which you want anyway). map keeps iterators to all elements stable, in C++17 you can even move elements from one map to the other without invalidating iterators to them (and if properly implemented without any potential allocation). map timings for single operations are typically more consistent since they never need large allocations. unordered_map using std::hash as implemented in the libstdc++ is vulnerable to DoS if fed with untrusted input (it uses MurmurHash2 with a constant seed - not that seeding would really help, see https://emboss.github.io/blog/2012/12/14/breaking-murmur-hash-flooding-dos-reloaded/). Being ordered enables efficient range searches, e.g. iterate over all elements with key ≥ 42. I've made a test recently which makes 50000 merge&sort. That means if the string keys are the same, merge the byte string. And the final output should be sorted. So this includes a look up for every insertion. For the map implementation, it takes 200 ms to finish the job. For the unordered_map + map, it takes 70 ms for unordered_map insertion and 80 ms for map insertion. So the hybrid implementation is 50 ms faster. We should think twice before we use the map. If you only need the data to be sorted in the final result of your program, a hybrid solution may be better. Reasons have been given in other answers; here is another. std::map (balanced binary tree) operations are amortized O(log n) and worst case O(log n). std::unordered_map (hash table) operations are amortized O(1) and worst case O(n). How this plays out in practice is that the hash table "hiccups" every once in a while with an O(n) operation, which may or may not be something your application can tolerate. If it can't tolerate it, you'd prefer std::map over std::unordered_map. If you are going to build small table (may be under 100 elements) and do lots of queries, use std::map. This is because reads on it are O(log n). If you are going to change table a lot then may be std::map is good option. If you are in doubt, just use std::unordered_map. In most languages, unordered map (aka hash based dictionaries) are the default map however in C++ you get ordered map as default map. How did that happen? Some people erroneously assume that C++ committee made this decision in their unique wisdom but the truth is unfortunately uglier than that. It is widely believed that C++ ended up with ordered map as default because there are not too many parameters on how they can be implemented. On the other hand, hash based implementations has tons of things to talk about. So to avoid gridlocks in standardization they just got along with ordered map. Around 2005, many languages already had good implementations of hash based implementation and so it was more easier for the committee to accept new std::unordered_map. In a perfect world, std::map would have been unordered and we would have std::ordered_map as separate type. Better use map, when you need to get elements by range, as they are sorted and you can just iterate over them from one boundary to another. "Internally, the elements in a map are always sorted by its key following a specific strict weak ordering criterion indicated by its internal comparison object (of type Compare). map containers are generally slower than unordered_map containers to access individual elements by their key, but they allow the direct iteration on subsets based on their order." Not the answer you're looking for? Browse other questions tagged c++ performance map unordered-map or ask your own question. How to choose between map and unordered_map? Is there any thing hashmap can do but map cannot? How to hash an unordered_map? Why is std::tr1::unordered_map slower than a homegrown hash map? How does std::unordered_map store and compare its keys to achieve fast access to elements without ordering?